JEANNE EARLEY, Edward J. Duggan Award for Outstanding Service-Private Counsel. The Edward J. Duggan Award for Outstanding Service, Private Counsel is given to an Assigned Private Counsel and is named for Edward J. Duggan, who served continuously from 1940 to 1997 as a member of the Voluntary Defenders Committee, the Massachusetts Defenders Committee, and the Committee for Public Counsel Services. 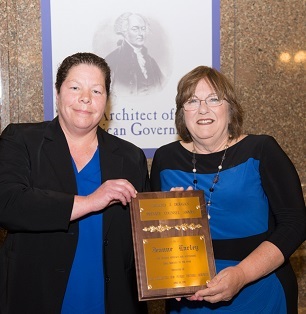 The award has been presented each year since 1988 to the private attorney who best represents zealous advocacy — the central principle governing the representation of indigents in Massachusetts. Jeanne Earley graduated from the University of Lowell in 1972 with a degree in Business Administration, and went on to receive a MBA from Boston University. But she finally recognized her true calling at New England School of Law and was admitted to practice in 1987. After opening her own law office in Westford, she became a bar advocate with the Middlesex Defense Attorneys and began her career. Jeanne is a member of the Board of Directors of the Greater Lowell Bar Association and active in supporting its many programs. Her contributions to the community are not limited to her law practice. She has been providing, cooking and serving food for over 100 people at the Soup Kitchen/Community Table for over 28 years. Every holiday season she provides not only a steak dinner with all the fixings, but every person who comes in for food is given a gift bag of socks, gloves, hats, candy and other necessities. No one was surprised to hear that when she was travelling with her daughter in Rome, she and daughter Christine volunteered at a homeless shelter. She is a mother, grandmother, and favorite aunt. A world traveler, she makes friends wherever she goes.